A 3 kg steel ball strikes a wall with a speed of 10.0 m/s at an angle of 60o with the surface. It bounces off with the same speed and angle. If the ball is in contact with the wall for 0.2 s, what is the average force exerted on the ball by the wall? In the elastic collision with the "infinitely" massive wall, the ball receives an impulse ∆p. Enough information is given to calculate ∆p. Since the contact time is given, Favg can be calculated. = (3 kg 10 m/s)sin60oi + (3 kg 10 m/s)cos60oj. = -(3 kg 10 m/s)sin60oi + (3 kg 10 m/s)cos60oj. ∆p = pf - pi= -2(30 kgm/s)sin60oi = -(51.96 kgm/s)i.
Favg = -(51.96 kgm/s)i/(0.2s) = -259.8 Ni. A block of mass m1 and initial velocity v1 collides head-on with a stationary block of mass m2. The mass m2 compresses a spring of spring constant k. Neglect friction and assume the collision is elastic. (a) What is the velocity v2' of m2 just after the collision? (b) What is the maximum compression of the spring? 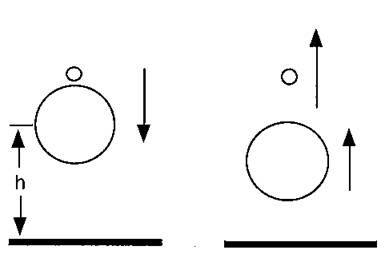 In elastic collisions energy and momentum are conserved. (a) Let v1'and v2' be the velocities of m1 and m2 just after the collision. Momentum conservation: m1v1 = m1 v1' + m2 v2'. Energy conservation: m1v12 = m1 v1'2 + m2 v2'2. v2' = 2v1/(1 + m2/m1). d = (m2/k)½2v1/(1 + m2/m1). A (non-relativistic) neutron in a reactor makes an elastic head-on collision with the nucleus of a carbon atom initially at rest. (a) What fraction of the neutron's kinetic energy is transferred to the carbon nucleus? (b) If the initial kinetic energy of the neutron is 1.6*10-13 J, find its final kinetic energy and the kinetic energy of the carbon nucleus after the collision. The collision of the two particles is elastic. (i) m1v1i = m1v1f + m2v2f. (ii) ½m1v1i2 = ½m1v1f2 + ½m2v2f2. v1f = v1i - (m2/m1)v2f from (i). v1f2 = v1i2 + (m2/m1)2v2f2 - 2(m2/m1)v1iv2f. v2f2 = (m1/m2)( 2(m2/m1)v1iv2f - (m2/m1)2v2f2) = 2v1iv2f - (m2/m1)v2f2. (1 + (m2/m1))v2f = 2v1i. v2f/v1i = 2m1/(m1+m2) = 2/13 = 0.15. (m2/m1)(v2f/v1i)2 = 12(0.15)2 = 0.284. (b) The initial kinetic energy of the of the neutron is 160 fJ and the final kinetic energy of the carbon nucleus is 45.4 fJ. (1 femtoJoule = 1 fJ = 10-15 J.) The final kinetic energy of the neutron is (160 - 45.4) fJ = 114.6 fJ. (b) or M is initially allowed to move? The maximum kinetic energy is transferred in a head-on collision. We use energy and momentum conservation. (a) If M is at rest and m = m1, M = m2. The maximum amount of kinetic energy transferred is ½Mv2f2 = [4mM/(M+m)2]T.
(b) If M is allowed to move, then the maximum amount of kinetic energy transferred is T, and m is at rest after the collision. 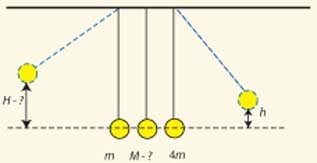 Two perfectly elastic balls, the larger of mass M and the smaller of mass m, with m << M, are dropped from a height h >> radius of either ball above a solid surface. Mass M rebounds elastically from the surface and mass m rebounds elastically from M. Find the height H that the small ball reaches in terms of h. You need only find an approximate result in the limit that m/M --> 0. The general result depends upon the ratio m/M. When an object of mass m1 << m2 and velocity v collides head on with an object of mass m2 at rest, then m1 rebounds with a velocity nearly equal to -v.
Assume M collides with velocity v = -(2gh)½ j = -vj with the ground. It rebounds with velocity vj. In a frame moving with velocity vj equal to the velocity of M right after the collision with the ground, m approaches with velocity -2vj and rebounds with velocity 2vj. In the lab frame m moves with velocity 3vj = (2gh')½ j right after its collision with M, and therefore rises to a height of h' = 9h. An elastic ball is dropped on a long inclined plane. It bounces, hits the plane again, bounces, and so on. Let us label the distance between the points of the first and the second hit d12 and the distance between the points of the second and the third hit d23. Find the ratio d12/d23. The component of the acceleration perpendicular to the inclined plane and the component of the acceleration parallel to the inclined plane are constant. The balls motion perpendicular to the inclined plane is a series of bounces from some initial height above the plane to the plane and back to the initial height. The time interval between successive contacts with the plane is constant. But the ball also accelerates in the direction parallel to the plane, so the distance along the plane between successive contacts with the plane increases. Assume the inclined plane makes an angle θ with the horizontal. Orient the axes of your coordinate system as shown in the figure. The x-axis makes an angle θ with the horizontal and the y-axis is perpendicular to the inclined plane. 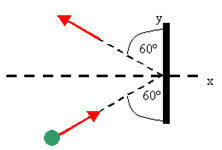 The ball is dropped vertically and just after the first bounce its velocity vector makes an angle of 90o - θ with the x-axis. Let x = 0, y = 0, t = 0 be the coordinates of the ball at the instant the ball makes contact with the inclined plane the first time. The ball bounces for the second time when y(t) = 0, t = ta = 2v/g. Just after the second bounce, the velocity of the ball is vx = 3v sinθ, vy = v cosθ. The ball bounces for the third time when y(t) = 0, t' = tb = 2v/g. Therefore d12/d23 = x(ta)/( x(ta + tb) - x(ta)) = ½. Three elastic spheres of equal size are suspended on light strings as shown; the spheres nearly touch each other. The mass M of the middle sphere is unknown; the masses of the other two spheres are 4m and m. The sphere of mass 4m is pulled sideways until it is elevated a distance h from its equilibrium position and then released. What must the mass of the middle sphere be in order for the sphere of mass m to rise to a maximum possible elevation after the first collision with the middle sphere? What is that maximum elevation H? In elastic collisions mechanical energy and momentum are conserved. For a collision between a sphere of mass m1 and initial velocity v1i and a stationary sphere of mass m2, energy and momentum conservation yield v2f = 2m1v1i/(m1 + m2). Let mass 4m move with speed v = (2gh)1/2 just before the first collision. Here we have for the collision between 4m and M: v2f = 8mv/(4m + M). Now v2f becomes v1i for the collision between M and m.
We have for this collision: vf = 16mMv/[(m + M)(4m + M)], where vf is the speed of mass m immediately after the collision. We want to maximize vf with respect to M.
dvf/dM = 0 --> 16m(M2 + 5Mm + 4m2) - 16mM(2M + 5m) = 0. 16M2 = 64m2, M = 2m. This is the only physical value for M for which dvf/dM = 0.
vf --> 0 as M --> 0 or infinity, we have a maximum. vfmax = (16/9)v = (16/9)(2gh)1/2. H = vfmax2/2g = (16/9)2h = 3.16 h.